The 2018 Major League Baseball season is one week away. On April 5, 2018, dozens of young prospects will begin their journey as the minor league season opens. 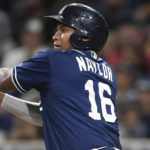 In this article, I will break down some of the top Padres’ prospects to keep an eye this season. The 19-year-old, Mexican, right-handed pitcher, signed in 2016, was the youngest prospect in the 2017 Arizona Fall League. 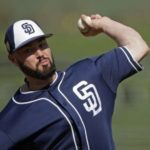 The San Diego Padres opted to send him there to pitch for the Peoria Javelinas in October of 2017. The AFL season couldn’t have gone much better than it did for Munoz. In nine appearances and eight 2/3 innings, the righty allowed just one run on four hits and two walks. He struck out 11 hitters to finish with a 1.04 ERA and a .138 opponents’ batting average. Munoz had a strong 2017 campaign coming out of the bullpen. He had predominantly short-season with Tri-City, and three appearances in Fort Wayne recording a 3-0 record with a 3.81 ERA over 26 innings across 24 relief appearances. Munoz allowed just 17 hits and allowed 18 walks against 38 strikeouts in that span. 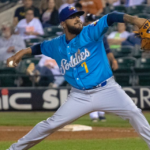 With a three-team minor league career, Munoz has recorded a 4.53 ERA in 45 2/3 innings pitched, and allowed three home runs with a win-loss record of 4-1. Scouting: Munoz has a top-notch fastball with a velocity of 95-99 MPH, topping off at 100. Average sweeping slider, but when it’s on, it’s a looser 10-to-4 breaker with more sweeping action than late bite. Command profile fits a short-stint relief role or closer. Munoz has the mechanics of a gunslinger; closed off to hitters and bent over to help hide the ball. 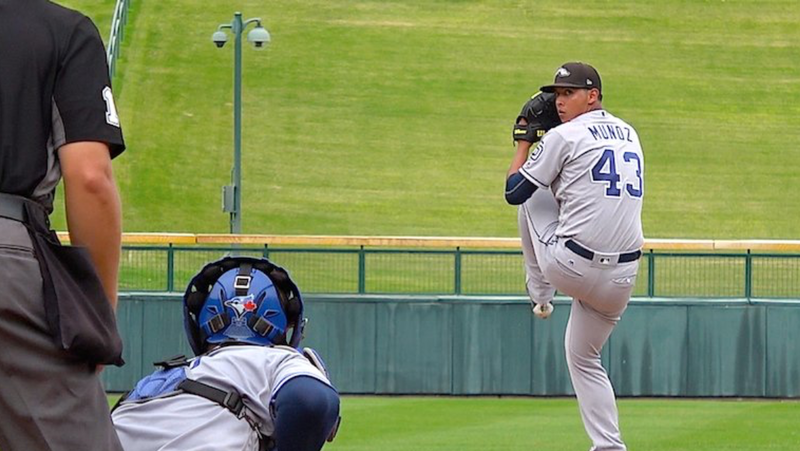 The Padres have pushed Munoz already. 2018 should be interesting for the young reliever. 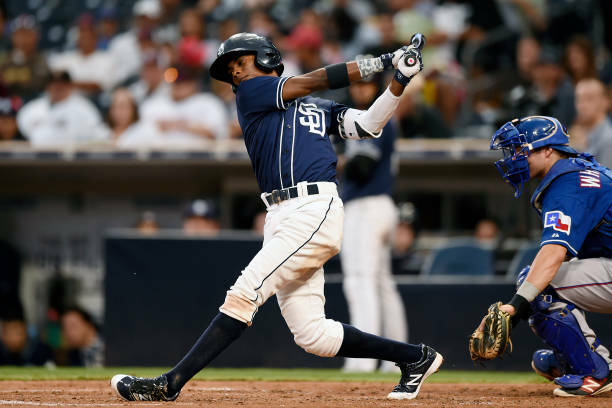 The 19-year-old Dominican infielder was acquired on July 24, 2017, when the Royals traded Matt Strahm, Travis Wood, and Esteury Ruiz to the San Diego Padres for Trevor Cahill, Ryan Buchter, and Brandon Maurer. While with the Royals, in 2017, Ruiz showed an aggressive approach in Arizona and his production was excellent with the bat. 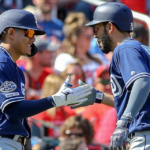 It was noted then that Ruiz may lack the arm strength to play shortstop at the higher level, but he looked exceptional at second base last summer, making only two errors in his first 17 games. 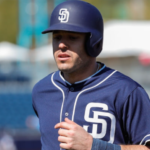 With the (Arizona Rookie League) AZL Padres-1, in only 31 games and 134 plate appearances he hit one home run, slashed four triples, recorded 10 doubles, totaled 16 RBI, and stole 17 bases. He put up a solid .300/.364/.475 batting line and a .839 OPS (On-base plus slugging). Scouting: The toolsy Ruiz excelled in rookie league ball in 2017. Expect continued success in 2018, though an initial dip would be expected. Great bat-to-ball skills. He has a lot of athletic ability, power, and speed. A unique profile at second base in that he is a bat-first second baseman. 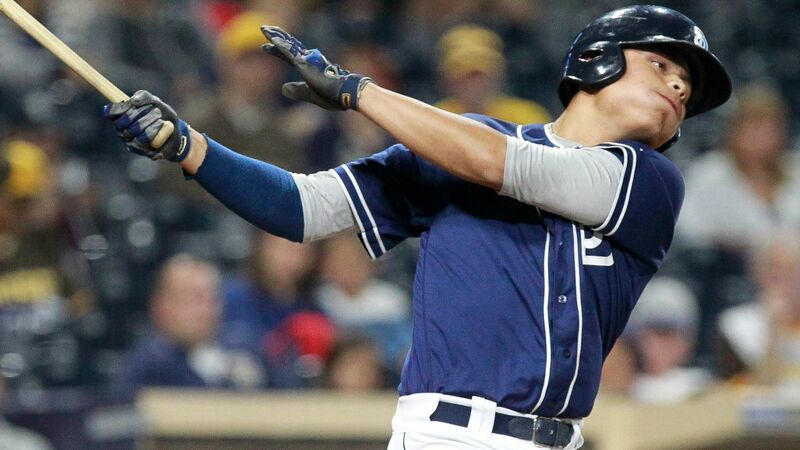 The 18-year-old Mexican outfielder and Tijuana baseball prodigy was signed by the Padres on July 2, 2016 . He was inked at the J2 signing period for $1.5 million. With the signing, Ornelas became the top “bonus baby” to ever come from Mexico. At the time, he was a lanky 16-year-old outfielder who was the property of the Mexico City Red Devils. In 2017, at just 17 years of age, Ornelas played his first rookie ball season for the AZL Padres-2, In 53 games and 238 plate appearances, he had three home runs, three triples, 11 doubles, 26 RBI, 40 base-on-balls, and put up a .276/.399/.408 batting line and .807 OPS. Scouting: Ornelas provides decent on base percentage, makes solid contact offensively. He could eventually play first base with real defensive benefits. Ornelas has a 6-foot-4 frame. He only carries 190 pounds, but there is some decent muscle potential and room to add strength. Ornelas is a very advanced hitter and very intelligent for his age. Tirso is a tremendous worker and has made significant gains since he was signed. In the end, it will certainly take time. The 18-year-old, Colombian, right-handed pitcher was signed on July 2, 2016 (J2 signings). 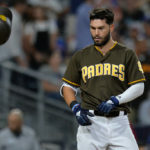 The Padres signed Patino for $130,000. Patino, from a relatively small town in Colombia, may have fallen under the radar as he has exploded since going pro. On June 2 ,2017 Patino was assigned to the Dominican Summer League (DSL) Padres where he started four games. In 16 innings pitched, he allowed no home runs, 1.69 ERA, 0.81 WHIP, and a win/loss record of 2-1. On June 24, 2017 Patino was promoted to the AZL Padres-1. In nine games there and eight starts, Patino pitched 40.0 innings allowing two home runs and recording a 2.48 ERA, 1.20 WHIP. He was 2-1 on the year there. At the age of 17, he has started his career with 56 innings pitched and an impressive 2.25 ERA. 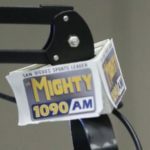 Scouting: In 2018 Patino most likely starts with the Tri-City Dust Devils. Patino is an athletic 6-foot-1, but his build is strong and similar to the smaller pitchers succeeding within the majors lately. He has four very strong pitches and can get his fastball in the mid 90’s, topping out at 95-97. He has some slider feel with an average slider and a nice curveball with good depth. Definitely a starter. The 18-year-old, Dominican, right-handed pitcher, signed with the Padres on July 2, 2016, (J2 signings) for $450,000. He was originally thought to be a first round draft pick if he were eligible for June’s draft. Miliano is listed at 6-foot-3 and 183 pounds. In 2016, Miliano attended fall instructional-league while at the age of 16. On June 24, 2017 Miliano was assigned to AZL Padres-1. In seven games there and five starts (15 innings pitched), he allowed one home run, and recorded a 6.60 ERA and a 1.67 WHIP. Miliano had 3-1 win-loss record. Scouting: Currently, Miliano can throw in the low 90’s, touching 94 mph with downhill plane. He locates his fastball to both sides of the plate, but there is tons of room for projection in his frame. Miliano has a feel for spinning an average curveball in the 78-80 mph range. The curveball has promising depth and Miliano shows some ability to locate it. The Padres may have found a diamond in the rough with this hurler. Thank you. More coming at you next week.